Location of 19th century Mennonite Church, 10th Concession, Blandford Township. The Blandford Mennonite Church (Mennonite Church) in Blandford Township, Oxford County, Ontario, had among its early family names Basinger, Newschwander, Strickler, Miller, Baer, Stauffer, and Bingeman. A frame church was erected about 10 miles (16 km) southwest of the Blenheim church and one and a half miles (2 km) from Bright. As early as 1851 Blandford appointments are listed in the Meeting Calendar every fourth Sunday. These meetings were served by ministers from Waterloo County. Jacob Bretz, who became minister in 1839 at Wanner's, moved to Plattsville and probably held responsibility at Blandford, although the preaching was still done by several ministers as above. He died in 1879. John Basinger was ordained deacon 22 October 1865, and resided near this place of worship. He died in December 1882. The Waterloo conference in September 1892 provided that the meetings in Blandford be held only during the six months in the summer. In 1904 the interest in this field had so far dwindled that the April Conference authorized Moses Cressman to make sale of the building. The burial place was maintained by the community. In 1917 the Conference appointed M. Cressman trustee for the Blandford church property. Location of the 1938 Blandford Mennonite Church, Ninth Line & Hubbard, Blandford Township, Oxford County, Ontario. The building was located inside the fence near the location of the sign. 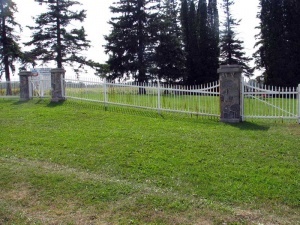 After 1938 Mennonite services in Blandford Township were revived in a church on the 9th Concession, one mile (1.5 km) east and south of the village of Bright where there was a community cemetery. This church formerly owned by the Evangelical Church came under the ownership of a cemetery board to serve as a community church. Members of the the St. Jacobs congregation, Waterloo County, Ontario, for a number of years gave regular attention to Sunday school, preaching, and visitation until a few Mennonite families moved into the community and the care of it has come under the Mennonite Mission Board of Ontario. A few converts were won so that there was a membership of seven. This new location, known as the Bright Mennonite Mission, was three miles (five km) east of the former site and cemetery. Moses N. Baer (1913-1978), who served as the minister at the Bright Mission in these years, is buried in the cemetery with his wife, Selema Brubacher Baer (1913-1988). He was one of the ministers who withdrew from the Mennonite Conference of Ontario in late 1959 and formed the Conservative Mennonite Church of Ontario; the Bright congregation was part of that conference until it closed in 1969. Its membership never exceeded 17. Cressman, Kenneth. A descriptive analysis of the Conservative Mennonite schisms in Ontario, 1956-1979. Unpublished paper, 1979. Fretz, Joseph C. and Sam Steiner. "Blandford Mennonite Church (Bright, Ontario, Canada)." Global Anabaptist Mennonite Encyclopedia Online. October 2009. Web. 20 Apr 2019. http://gameo.org/index.php?title=Blandford_Mennonite_Church_(Bright,_Ontario,_Canada)&oldid=114501. Fretz, Joseph C. and Sam Steiner. (October 2009). Blandford Mennonite Church (Bright, Ontario, Canada). Global Anabaptist Mennonite Encyclopedia Online. 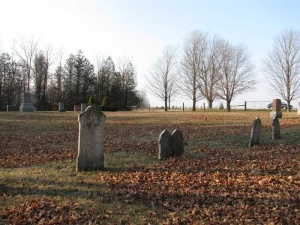 Retrieved 20 April 2019, from http://gameo.org/index.php?title=Blandford_Mennonite_Church_(Bright,_Ontario,_Canada)&oldid=114501. This page was last modified on 28 February 2014, at 20:55.